The Attorneys at Linkhorst & Hockin, P.A. are highly-qualified and community involved Florida construction lawyers exclusively focused on practicing construction law. The Attorneys at Linkhorst & Hockin, P.A. are highly-qualified and community involved Florida construction lawyers exclusively focused on practicing construction law. Recently, we had the privilege of attending and sponsoring amazing industry events. We attended the Construction Association of South Florida‘s Meet the Contractors Night. 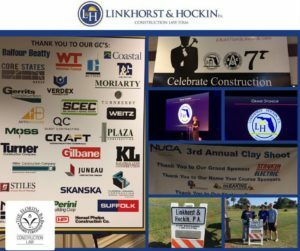 We proudly sponsored the NUCA of South Florida‘s Annual Clay Shoot. Lastly, we were Grand Sponsors of the 69th Installation of the Board for the Associated General Contractors Of America Inc., Florida East Coast Chapter We were sworn in as Board Members and General Counsel for the organization. We are humbled and excited by the honors.